Want to win friends and influence people? I say it’s a sure thing if you bake them fresh bread. 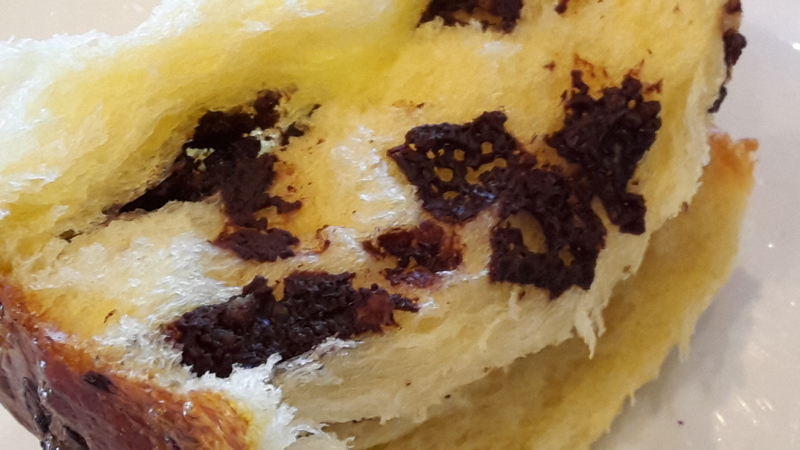 Bread week was one of my favourites at cooking school – I loved the smell, watching the reaction of yeast and even the waiting. Somehow, I gained the required patience to give great results. The object of my affection at the moment is brioche. In a time where gluten is evil and half the world is going carb free, I am slowly becoming obsessed with making the perfect loaf of golden buttery goodness. Much to the amusement of fellow holiday goers, I’m taking fresh yeast and a dough scraper away with me these days. While others are sleeping, I’m getting dough from the fridge and cranking up the oven. No one is laughing when they hit the breakfast table! Here’s the recipe we used at school. It’s yet to fail me. Dissolve the yeast and one teaspoon of the sugar in the milk. Set aside for about five minutes to froth. Sift the salt and flour into a large mixing bowl, add the sugar and mix (dry ingredients), then make a well in the centre. 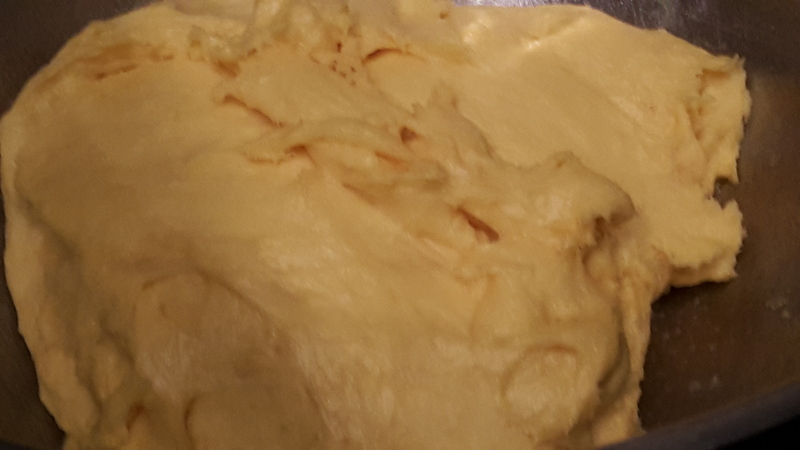 Once the yeast has frothed, add the beaten eggs to the mixture. Pour this liquid into the dry ingredients. Bring the dough together and knead on a flour dusted bench for around five minutes until smooth. The mixture is quite wet and don’t be tempted to over flour the bench. A dough scraper comes in handy with the kneading. Add the butter, a couple of cubes at a time, and continue kneading until the butter is combined and the dough is silky smooth. Transfer the dough into a greased bowl. Cover with cling film and set aside to double in size (around an hour). 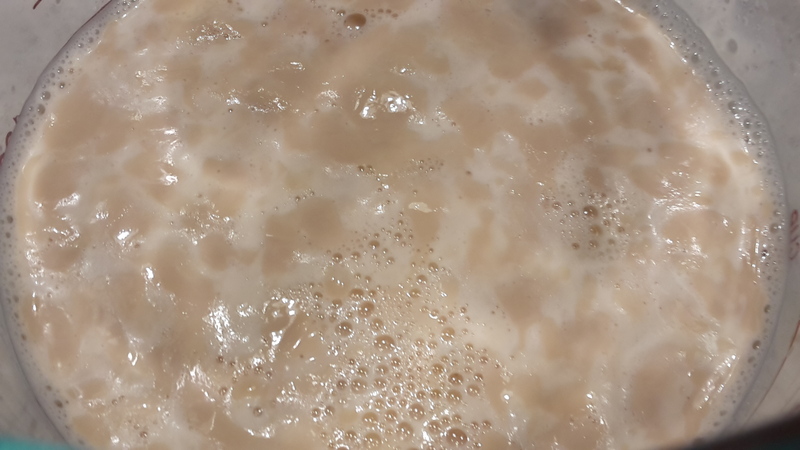 My preference here is to put the dough into the fridge over night, then bring it out the next morning and bring to room temperature (image is of dough the next morning). Spray oil a loaf tin. Divide the dough into eight equal portions. Roll as you would a bread roll and put each “roll” into the prepared tin (ie. two rows of four rolls). *Cover with cling film and set aside to double in size (around 40 minutes). Turn on oven to 200C – you’ll want it to be hot when the dough is ready to go in..
Brush the brioche with egg wash – do this gently so not to deflate the dough. **Bake for five minutes, then reduce oven to 180C and bake for another 20-30 minutes until dark on top, around the sides and bottom. Cool for 10-15 minutes in the tin but do remove from the tin while the brioche is still warm. Serve with lashings of butter – diners can break off their own piece. What is lovely about this recipe is that you can modify it and add flavours. 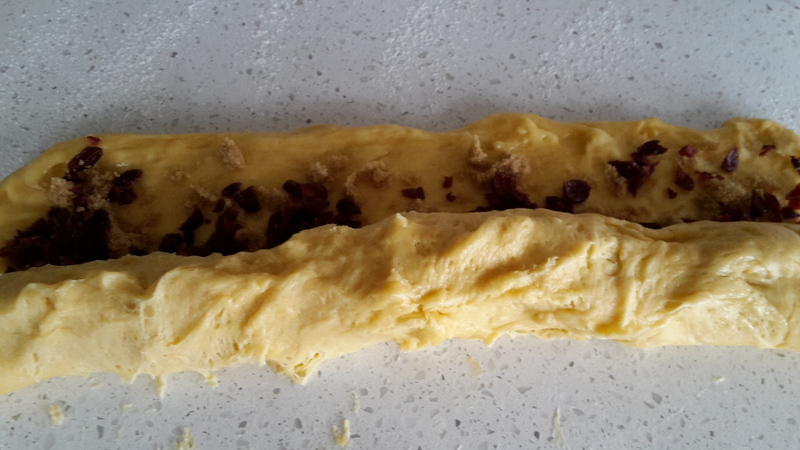 Instead of dividing the dough into balls, roughly roll into a large rectangle. Then add your topping. 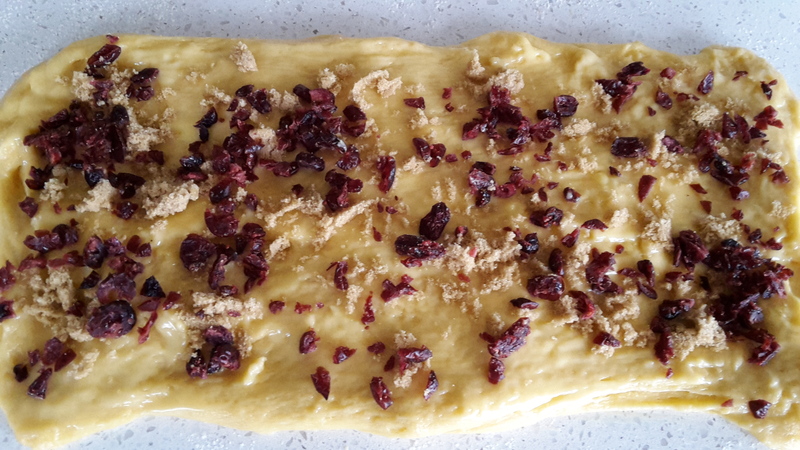 In this case, I lightly brushed with a little melted butter, then sprinkled with brown sugar and chopped dried cranberries. 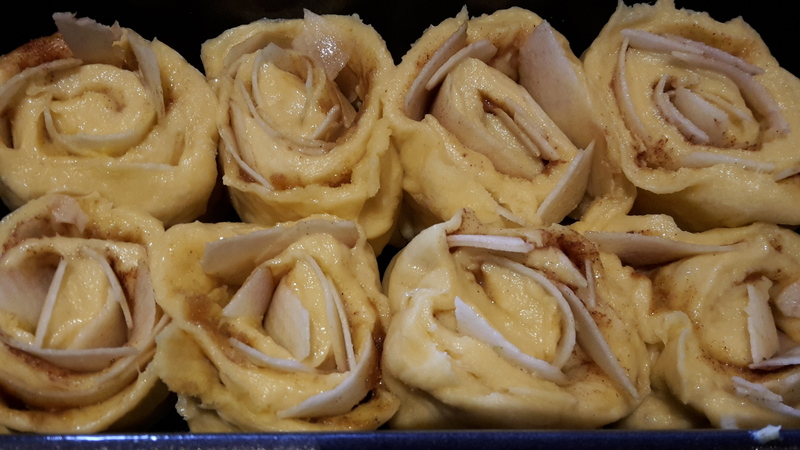 Roll the dough as you would pinwheels***, then cut into equal size pieces. Place the cut pieces, pinwheel side up, into the prepared tin. Cover and set aside to rise (as detailed * above). Then cook as per ** above. This photograph shows an apple and cinnamon brioche – in case you are wondering where the cranberries have gone. If you’re up for something rich and scrummy, use chocolate. I broke about 60grams of dark chocolate with orange and sprinkled it over the rolled rectangle (then follow the instructions *** above). Whatever flavour you decide on, it’s bound to become a breakfast favourite. Or, try a plain brioche with soup for dinner. Any excuse to eat it will do. It was with pleasure that I retired my old bread machine to the Sallies last week – I haven’t used it for years. There is something mighty satisfying about making bread by hand. I challenge you to give this a go. As always, you won’t be disappointed.